We are entering a new world that is abandoning luxuries and restricting itself to rational consumption, to what a regular person needs. We won’t be able to produce washing machines that go out of order in three years, while today it’s being done intentionally so that instead of fixing it, one would buy a new one. We’ll have to move into a new state of existence. That’s what the governments of the world must understand. But how are they going to keep their nations pacified? How will they educate and explain all the facts to them? This is why we must prepare a package of educational resources that stands on a firm foundation and demonstrates this with absolute clarity that we will offer to everyone. There is no other option: We must study the new world. You won’t have to go to work. You will be going to school instead, but not for the sake of learning. You will study how to receive real pleasure from life. Is it worth it? You won’t be able to continue working anyway; nobody needs you anymore. The Great Depression was part of the development, an intermediate decline in the cyclic process, but today it all has changed. We are running out of resources. We’ve come to the threshold of a new phase. Plenty has been written about it. Hence, our job is to inform the public that the old era has come to its end. There aren’t and won’t be any more jobs. How will people make a living then? Well, let’s make only goods that we need and just enough for everyone, while we learn how to distribute them properly and how to live in the new world. We have to tell them about human evolution and history, the growth of egoism up to its final stage, the stage of integration and the laws by which the integral system operates, the interconnection of all its parts, and how reciprocity and the real connection unfold in it. This is our only option for this is what nature is forcing us to do. We are supposed to come to a state of balanced consumption, like the animals who take from nature only as much as they need to sustain themselves. They do it instinctively, without calculating, whereas we must structure our relationship with nature consciously, sensibly, through learning, restricting ourselves, and taming our evil inclination, simply because we understand that we can’t afford to do otherwise. Yet, how will we satisfy our egos when man wants to consume the world and he is asked to be happy with just food and shelter? “Is that all? What am I, a bear in a cave, a bird in a cage?” "Certainly not, you will receive even greater fulfillment than you wished for before, but never got. It can be done. Let’s find out how to get there." Thus, we obligate the public to learn, lead them toward it. No one will want to do it unilaterally; everybody seeks immediate gratification. So, we have to prepare a package of educational resources and a system of public education. It will start slowly. Right now, we can’t openly tell this to the world, but it’s time we devise and disseminate materials about what’s causing a crisis. This will shed light on the solution. After all, there is nothing else out there. Like it or not, you will have to do what you have to do. From the 4th part of the Daily Kabbalah Lesson 5/31/2011, "The Peace"
Question: During the reading of The Zohar, I feel very strong disturbances and hardly feel the text itself. How can I overcome this obstacle? Answer: Everything depends on the persistence in one’s thoughts. During my life, I have talked to many people suffering from serious illnesses. They fathom their illnesses in great details and are familiar with all the medical terms known only to the specialists in this area. Why? Their lives depend on that. The desire to survive forced people to learn the causes of their illnesses and to seek remedies and various methods of treatment. We don’t fully realize that we are dependent on our understanding of the “disease,” on the search for its cure. I shouldn’t rely on anyone else; I have to invest all of my effort into finding the cause of my illness, the remedy appropriate for my condition so that finally this remedy takes effect. If people really feel danger, this forces them to learn how to save themselves. You are saying: “I hardly feel anything…” True, you do not feel the “disease.” Thus, the group has to work harder on you, and you should try to be persistent in your thoughts and pray that you will be shown from Above that we are talking about you. The abyss between the world of Infinity and your current state can be seen in this obvious demonstration that The Zohar is now showing within you. Imagine this: If you were corrected now, you would feel the world of Infinity, the entire Zohar would be revealed within you, and you would see everything. To sense this, you lack only the vessels of perception, the corrected desires. At least realize what is happening. Question: What would you wish for a person who has not yet decided to attend the Moscow convention? Answer: I would wish the undecided to quickly and categorically decide: “I am going to the convention!” Right now, you have this opportunity, and you do not know when another one will present itself. Even if we were to have yearly conventions in Russia, you should not wait for next year. Question: If I really want to be at the convention, but I am unable to go, what should I be doing during the convention? Answer: When a person is unable to attend the convention, he should be with us virtually as much as the time allows. First of all, conventions are held on weekends, so you should free yourself from all things and problems, of all responsibilities as much as possible. Try to get together with your friends who study Kabbalah and create the same convention-like atmosphere. Set a table with treats and have a good time together observing us. Be with us with your heart and soul. Question: What should I do when I am afraid of the problems and disturbances that arise before me? How can I overcome this? Answer: You need to connect with the group, with your friends, and with us. You need to try to evoke the upper Light, and you will see it lift you above these problems. I do not see a solution other than this. Question: What is so special about the Torah that even The Book of Zohar is just a commentary on it? Answer: The records that Moses made on parchment are the earthly expression, through material symbols, of spiritual actions of Light on desire. Moses wrote down everything he taught his students in a book. Over the course of 40 years of wandering in the desert, they wrote down the whole Torah, going through the entire process in record, as well as in bodies, and in spirituality. This is the entire path from the Egyptian exile (earthly and spiritual), through the desert (earthly and spiritual), and into the land of Israel (earthly and spiritual). All of this came true in the connection between the root and the branch. Moses expressed this entire process in this concrete, symbolic form. The Zohar expresses the same process on a different level, in a different form because the general desire to enjoy that the Creator created had by that time advanced several steps forward and was perfected by the influence of the Light. Therefore, this desire, which went through ascents and descents, the destruction of the First and Second Temple, the exile, and then reached the last breakage before the last exile, had to be given the method that is appropriate for the end of the exile, for our time. That is why The Book of Zohar was written, whose authors were the successors of many generations of Kabbalists, starting from Abraham until the destruction of the Temple. Rabbi Shimon was the student of Rabbi Akiva, who revealed a great Light, and therefore he was able to express this in The Book of Zohar. The Torah is the revelation of Light. The Light that comes to Malchut contains everything that is necessary for changing Malchut. But this Light still hasn’t come true in practice, and is therefore called “the oral Torah.” For now this is work with the screens. Under the influence of the same Light in Malchut, inner changes take place and are impressed in Malchut, this is called “the written Torah.” This is talking only about actions of the Light in the desires from the beginning of creation and until its end. That’s because there is nothing in existence besides desires. Among these desires some feel that they exist by themselves, separate from all the others. This is us. These desires contain qualities that can help them on the path of correction. And that is why we receive a sensation of lacking, our own lack of correction, the realization of evil. This is how we perceive ourselves. These are exactly the desires that need to be given “the Torah”—the instructions explaining how they can participate in their own corrections out of their own free choice, how they can attract the Light by wishing to become corrected faster, instead of waiting for the Light to come and shake them up. Both stages of the correction of egoism, its correction in relation to one’s friend and in relation to the Creator, …pursue the same goal, namely performing actions for the benefit of the Creator. It makes no difference if one works for one’s friend or for the Creator. That is because … anything beyond his own interests appears to be unreal. The imperative of “love thy friend as thyself” is the ultimate goal of all actions. …It’s impossible to be mistaken in its fulfillment since we know that if we place the needs of our friends before our own, it is bestowal. Hence the goal is not to “love the Lord your God with all your heart and with all your soul” for it is completely equivalent to “love thy friend as thyself.” … With regards to the Creator, one may deceive oneself; and with one’s friend it is always spread out before his eyes. Question: People can understand the need to make concessions to one another, but how can you explain the Light of correction to a regular person? Answer: The Light is the quality of bestowal, the upper force that is present in nature, which advances us, gives us life, corrects us, and moves us forward. Throughout the millennia of man’s existence on earth (without considering the millions of years of development of the still, vegetative, and animate levels of nature) we developed coercively, by means of the force hidden within nature. There is a certain program inside of it, an engine that operates by that program, setting all of creation in motion and causing its development. Scientists are revealing that 15 billion years ago our universe began to develop as a result of the Big Bang. That is to say, the universe contains a developmental force. And now this force continues to develop us further, which is called “the natural course of history” (Beito). This means that I awaken good forces of development in nature. If I agree with the development, desire it, and aspire to the same goal myself, awakening the desire inside of me even before nature starts putting pressure on me, then I will feel good and comfortable! I will merit understanding and will shorten my path. In essence, this is all that we have to do! We have to run forward ourselves, like a mouse running away from a cat. When a person becomes wiser, he understands that the developmental press is moving upon him. On the other hand, there are people who still don’t notice or feel this press that is catching up to them. That means it still hasn’t gotten close enough to them and does not evoke great suffering. Imagine that you are running down a road and a huge press is chasing you, just about to crush you. If you already feel this, then you will look for a way to be saved from it. You have nowhere to run. On both sides of you there are buildings stretching out for many miles, and you are running down a narrow road between them, while the press is rolling forward right behind you. This is an astonishing picture…. You don’t want the press to squish you into the asphalt, do you? Some people already feel that they are in this state, while others don’t feel it yet. Nevertheless, it’s all a matter of time. Maybe you feel good for now, like a person falling from the 10th story, and while passing the 8th floor he tells his neighbor who’s staring out the window, “How are you? Everything’s OK for now.” This is how the world is “OK” today, but it doesn’t understand it yet. We have only the desire to receive and the form of bestowal with which we must clothe desire time after time. This is man’s work which can only be performed by connecting to the group, the right environment, and assuming its form. There is no other place where I can learn the correct form which I need to assume. The group is like a template which imparts to a person the correct contours. The breaking of the vessels and the process of preparation are all that we need for everyone to seek out his own place, time after time, perfecting our efforts until we become a single whole. Question: I can request only correction. Does this mean that I decide or define something myself? Answer: I have the line of the Light and the line of the vessel. I build myself as the third line between them. I take as much as I can from the desire to receive and from the Light and build the final form, the sum of these forces (Σ). This form is a human being. Even though the components are not mine, I have to combine them and decide the right combination. I decide this myself. To do that, I first have to feel the shame that I do not resemble the Giver, determine the working material, and find the force that corrects it. I am required to create a human being within me, to desire that he become formed. I already have the forces and material. 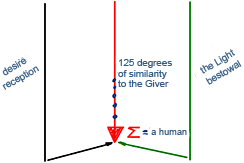 I have only to check the form, and I perform this check every time on the 125 degrees of similarity to the Giver. I check myself relative to the upper one and identify my abilities. This is a very big job. Thanks to it, I begin to accept, feel, and understand Him. I “format” or “draw” myself in search of exact solutions. As a result, I become like the Creator, not according to superiority, but according to bestowal. In receiving in order to bestow, I make myself similar to Him. From the 4th part of the Daily Kabbalah Lesson 5/24/2011, "Preface to the Wisdom of Kabbalah"
Question: On one of the lessons I heard you say that when we read The Book of Zohar, a kind of flow arises that connects us. How do we join this flow, despite the various disturbances that awaken during the lesson? Answer: This happens gradually. You must get used to it, to exert a certain amount of effort, to discover how to approach the text, how to connect it to yourself, to the state in the group, to the world; to learn where you get confused and where you don’t. You must unify yourself and the Torah in one. Then, to the extent of your desire to connect to the Torah which speaks of your inner state, you begin to receive the Inner Light contained in it, which influences you, allowing you to see within the system it describes. This happens in the process of the study, when the Light (the Creator) teaches you. If you try to move straight toward the goal, as much as you can, to use the group and the study correctly, if you’re ready to relinquish your egoistic aspirations and plans at least a little, then the Torah teaches you—the subsequent spiritual states are revealed in you.